Kelly C. Young-Wolff, PhD, MPH, is a licensed clinical psychologist and research scientist at the Kaiser Permanente Northern California Division of Research. She is also an Adjunct Assistant Professor in the Department of Psychiatry, University of California, San Francisco. Dr. Young-Wolff received her BA in psychology and anthropology from the University of California, Berkeley, and her MPH and doctorate in Clinical Psychology from the University of Southern California. She completed her NIDA-funded predoctoral fellowship at Yale University in the Department of Psychiatry and her NHLBI-funded postdoctoral fellowship at the Stanford Prevention Research Center in the Stanford School of Medicine. Dr. Young-Wolff’s research interests include investigating how stress and trauma, genetic factors, and health-related policies shape disparities in the onset and course of drug and alcohol abuse, tobacco use, and psychiatric disorders. 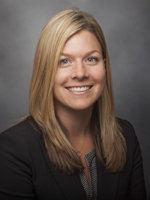 She is also interested in conducting research to inform the development of effective behavioral interventions for complex patients with multiple, co-occurring psychiatric and addictive disorders. The overarching goal of this K01 study is to identify recent trends in prenatal substance use and develop data-driven, evidence-based, generalizable predictive models to identify women at greatest risk for continued substance use in pregnancy. Specifically, we aim to: 1) Comprehensively establish trends in prenatal substance and polysubstance use (2009-2017); 2) Develop predictive statistical models of clinical and demographic characteristics to identify women at greatest risk for continuing to use substances during pregnancy; and 3) Conduct qualitative interviews with women who quit vs. persisted in substance use during pregnancy. This study examines the feasibility and acceptability of adopting ACEs screening in two Kaiser Permanente Northern California women’s health clinics. Results of this patient- and clinician-focused study will inform the viability of implementing ACEs screening as part of usual prenatal care and can be used to develop improved screening protocols. The overall objective of this study is to examine how the implementation of landmark health care legislation has impacted the population of smokers in a private health care delivery system, their treatment utilization, and their smoking cessation outcomes over time. New insured smokers through Medicaid expansion and CA exchanges are likely to be a vulnerable group, with a higher prevalence of comorbidities, and unique barriers to utilization of tobacco treatment. The study is designed to test whether newly insured patients have a higher percentage of comorbidities and differential use of tobacco cessation counseling. Further, the study will test whether variation in benefit plan and coverage among post-ACA new member smokers differentially impacts tobacco cessation counseling utilization and smoking cessation outcomes longitudinally. This study assesses the implementation and effectiveness of a perioperative smoking cessation intervention integrated into usual care for patients who smoke who are scheduled for elective surgery. Results will inform the feasibility of a real-world intervention in day-to-day practice that could be easily implemented in most perioperative settings. Med Care. 2017 Mar 10. Clin J Pain. 2016 Nov 28. Transforming the Health Care Response to Intimate Partner Violence: Addressing "Wicked Problems"
Psychiatr Serv. 2016 Apr 15:appips201500337. J Surg Res. 2019 Jan 18;237:30-40. Epub 2019-01-18. Drug Alcohol Depend. 2019 Mar 01;196:66-70. Epub 2019-01-18. Drug Alcohol Depend. 2018 Oct 06;193:124-130. Epub 2018-10-06. Med Care. 2018 Sep 18. J Womens Health (Larchmt). 2018 Sep 05. Ann Intern Med. 2018 Aug 21. JAMA Intern Med. 2018 Aug 20. Med Care. 2018 May 17. J Womens Health (Larchmt). 2018 Jan 19. Prev Med. 2018 Jan 19. Nicotine Tob Res. 2017 Oct 20. Intimate Partner Violence, Smoking, and Pregnancy: What Can We Do to Help? J Womens Health (Larchmt). 2017 Sep 22. Prev Med. 2017 Dec;105:32-36. Epub 2017-08-16. Subst Abus. 2017 Jul 19:0. J Psychoactive Drugs. 2017 Apr 20:1-9. Int J Environ Res Public Health. 2017 Apr 13;14(4). Epub 2017-04-13. Annu Rev Public Health. 2016 Dec 16. Am J Prev Med. 2016 May 27. Patient Educ Couns. 2016 May 17. ​Alcohol Clin Exp Res. 2016 May;40(5):939-41. doi:0.1111/acer.13050. Epub 2016 Apr 7. ​Int J Behav Nutr Phys Act. 2015 Dec 3;12:143. doi: 10.1186/s12966-015-0305-2. Psychiatr Serv. 2015 Apr 1;66(4):443-4. ​Nicotine Tob Res. 2015 Apr;17(4):479-85. doi: 10.1093/ntr/ntu205. ​Nicotine Tob Res. 2015 Mar;17(3):285-91. doi: 10.1093/ntr/ntu141. Epub 2014 Sep 4. Electronic Cigarettes in Jails: A Panacea or Public Health Problem? Addict Behav. 2015 Feb;41:142-7. Epub 2014-10-23. ​Tob Control. 2015 Jan;24(1):48-53. doi: 10.1136/tobaccocontrol-2013-051174. Epub 2013 Aug 30. ​Health Psychol. 2014 Dec;33(12):1518-29. doi: 10.1037/a0035164. Epub 2014 Jan 27. ​Am J Public Health. 2014 Aug;104(8):1454-63. doi: 10.2105/AJPH.2014.301917. Epub 2014 Jun 12. ​Addict Behav. 2014 Aug;39(8):1231-4. doi: 10.1016/j.addbeh.2014.03.024. Epub 2014 Apr 5. Are statewide restaurant and bar smoking bans associated with reduced cigarette smoking among those with mental illness? ​Nicotine Tob Res. 2014 Jun;16(6):846-54. doi: 10.1093/ntr/ntu014. Epub 2014 Feb 24. ​Psychiatry Res. 2014 Jan 30;215(1):87-94. doi: 10.1016/j.psychres.2013.10.037. Epub 2013 Nov 5. ​Alcohol Clin Exp Res. 2014 Jan;38(1):241-8. doi: 10.1111/acer.12226. Epub 2013 Aug 9. ​J Interpers Violence. 2013 Oct;28(15):3059-83. doi: 10.1177/0886260513488692. Epub 2013 May 17. ​J Trauma Stress. 2013 Aug;26(4):451-8. doi: 10.1002/jts.21829. Epub 2013 Jul 18. ​Alcohol Clin Exp Res. 2013 May;37(5):804-10. doi: 10.1111/acer.12041. Epub 2012 Dec 14. ​Drug Alcohol Depend. 2013 Mar 1;128(3):214-21. doi: 10.1016/j.drugalcdep.2012.08.028. Epub 2012 Sep 20. ​Addict Behav. 2012 Oct;37(10):1176-80. doi: 10.1016/j.addbeh.2012.05.009. Epub 2012 May 25. ​Evid Based Ment Health. 2012 Aug;15(3):57. doi: 10.1136/ebmental-2012-100670. Epub 2012 May 11. ​Alcohol Clin Exp Res. 2012 Apr;36(4):693-704. doi: 10.1111/j.1530-0277.2011.01630.x. Epub 2011 Sep 6. Clin Psychol Rev. 2011 Jul;31(5):800-16. doi: 10.1016/j.cpr.2011.03.005. Epub 2011 Mar 23. ​Behav Genet. 2011 Jul;41(4):499-511. doi: 10.1007/s10519-010-9401-x. Epub 2011 Mar 3. ​Psychol Med. 2011 Jan;41(1):59-70. doi: 10.1017/S0033291710000425. Epub 2010 Mar 29. ​Drug Alcohol Depend. 2010 Mar 1;107(2-3):230-6. doi: 10.1016/j.drugalcdep.2009.11.003. ​Alcohol Clin Exp Res. 2009 Aug;33(8):1476-86. doi: 10.1111/j.1530-0277.2009.00978.x. Epub 2009 May 4.